The couple surrounded by some of their younger relatives, including Poppy and Mila Hager. 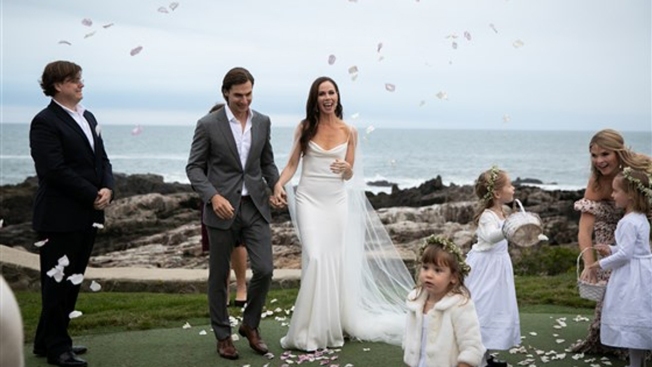 Former first daughter Barbara Pierce Bush tied the knot at the Bush family's compound in Maine over the weekend. The 36-year-old co-founder of a health nonprofit organization wed screenwriter Craig Louis Coyne Sunday in a private ceremony, NBC's "Today" show reported. Bush is the daughter of former President George W. Bush and Laura Bush, and the granddaughter of former President George H.W. Bush, all of whom attended the wedding at Walker Point compound. Former first lady Barbara Bush, the bride's grandmother and namesake, died in April at 92. Bush's twin sister, "Today" anchor Jenna Bush Hager, served as the matron of honor and her two children had roles in the ceremony. The couple will live in New York. Exciting news from the Bush family… @jennabushhager’s twin sister Barbara got married last night!